By David Kennedy, Jim O'Gorman, Devon Kearns et al. David Kennedy is Chief Information Security Officer at Diebold Incorporated and creator of the Social-Engineer Toolkit (SET), Fast-Track, and other open source tools. He is on the Back Track and Exploit-Database development team and is a core member of the Social-Engineer podcast and framework. Kennedy has presented at a number of security conferences including Black Hat, DEF CON, ShmooCon, Security B-Sides, and more. Jim O'Gorman (Elwood) is a professional penetration tester, an instructor at Offensive Security, and manages Offensive Security's consulting services. Jim has lived online from the times of BBS's, to FidoNet, to when SLIP connections were the new hotness. Jim spends time on network intrusion simulation, digital investigations, and malware analysis. When not working on various security issues, Jim spends his time assisting his children in their attempts to fight Zombie hordes. Devon Kearns is an instructor at Offensive-Security, a Back Track Linux developer, and administrator of The Exploit Database. 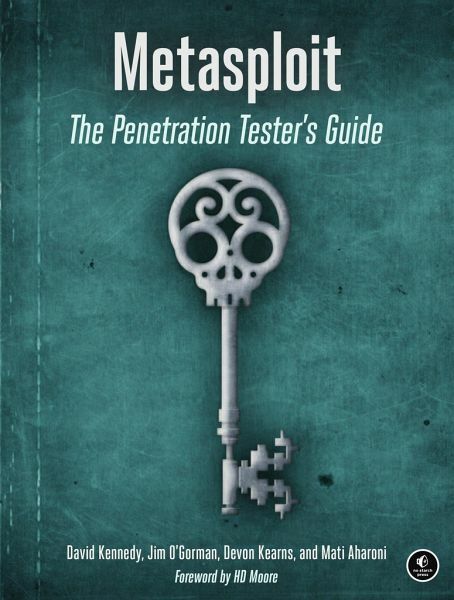 He has contributed a number of Metasploit exploit modules and is the maintainer of the Metasploit Unleashed wiki. Mati Aharoni is the creator of the Back Track Linux distribution and founder of Offensive-Security, the industry leader in security training. 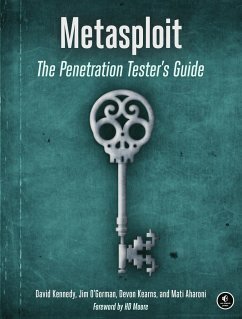 "It's a great book to get people started, has examples to walk through, and includes more advanced topics for experienced users."